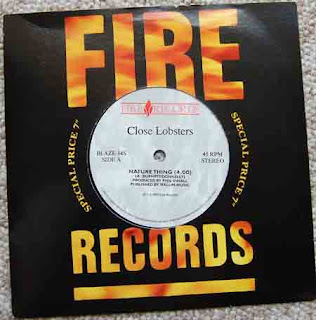 Close Lobsters 7" anyone? 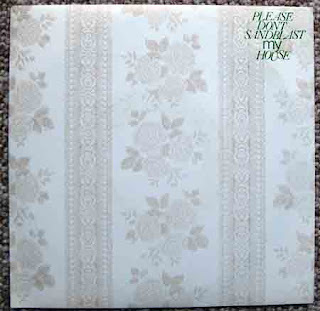 That's handy, because that's exactly what I've got here and we're instantly back in familiar territory with a band that were featured on the legendary C86 tape and were released on the marvellous Fire Records; erstwhile home of Teenage Fanclub, Pulp, Spaceman 3 et al. So, formed in Scotland by brothers Andy and Bob Burnett (vocals and bass respectively), Tom Donnelly (guitar), Stuart McFadyen (drums) and Graham Wilkington (possibly also bass; two basses! RÖCK! ), the band were moderately successful and troubled the indie charts scorers regularly from 1986-1989; they supported such luminaries as the Jesus and Mary Chain (although from a quick look around the internet it seems that pretty much anybody from Scotland who ever picked up a guitar supported JAMC at some point) and latterly had a song covered by The Wedding Present in their 12 singles in a year phase. Their official site is a Geocities monstrosity, so you'll be lucky to see it (one day I must get around to rescuing all those poor band pages that live on Geocities...) and there's a wiki and myspace page needless to say. Have I done Gene? I can't remember. This isn't about Gene though, this is about Sp!n the band that Martin Rossiter's band mates were in before they were in Gene. And yes, there really was an exlamation mark in the name. No matter what blogger wants me to do with the title, it's Sp!n, not Spin. Consisting of Lee Clark on singing/guitar and initially Daz Walton on bass, the band were formed in that London in 1988. Soon after, John Mason replaced Walton on bass and Matt Wingley (possibly aka Matt James) took over drumming. Subsequently Steve Mason (John's brother) joined to play geetar. 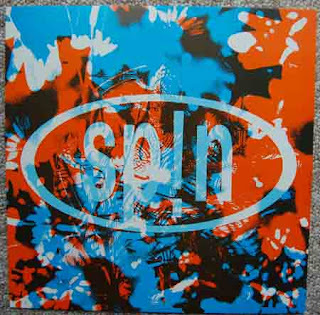 Right, now, now that's in order... By 1991 the band had knocked out a few good EPs and an album when a serious motorway accident left John Mason in a coma and their tour manager and sound man seriously injured. Unable to carry on, the band split and the remaining members went off to form Gene with Mr Rossiter and the rest is history. I don't know what happened to Daz Walton mind you. And there you go, oddly placed punctuation marks, only one bloke away from becoming Gene, a lovely bit of indie guitar, what more can you ask for? Wasn't Martin Rossiter famous for something else? I'm sure he was, I just can't drag that bit of information out of the back of my memory at the moment, I'll come back to it. Ps, there is a Gene 'Best of' that's worth getting as well. Are you lot still here then? Apologies for slow/few updates recently, long story; can I make it up to you with 1000 Violins? Anyway, 1000 Violins were brought to my attention when I was sorting out The Dylans at the end of last year; I made a little note in my book and then forgot all about it until the other day. Turns out you see, that Colin Gregory the guitarist of this lot went on to form the Dylans where he knocked out cracking indie pop in the early 90s. After the band split they fantastically became big in Japan - the ultimate indie dream; however, by that time they had unfortunately lost David Warmsley to cancer in 1992. Another of those sad losses that I've stumbled across doing this nonsense. You can of course have more in the All Music Guide and wikipedia pages should you wish. Apparently the internet is helping the band gain latter day popularity, so it's nice to be able to help them along in some little way. The 'Best of...' is occasionally available on (Amazon ) and is definitely worth hunting down if you can.